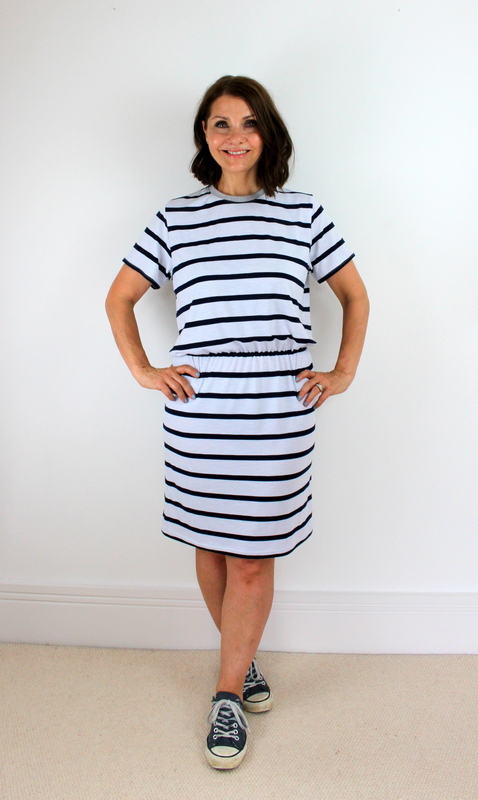 A Breton striped Tilly and The Buttons Coco dress. 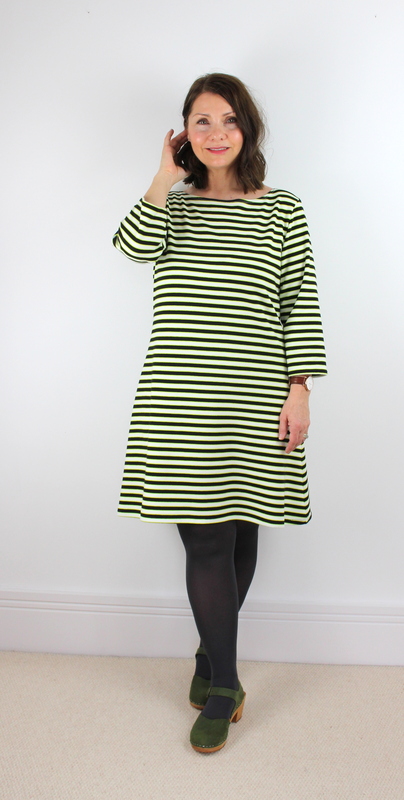 When browsing back through the archives on my blog I realised that it has been a year since I last made a Coco dress . My final thoughts after my last Coco were that I would like to make it in a striped ponte fabric. Voila! 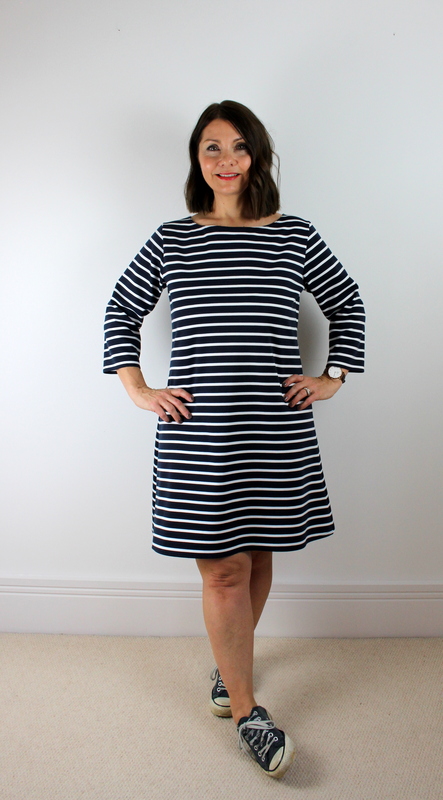 I have had this navy and white striped ponte roma in my stash for a long time now, I can’t remember when I bought it but I have a feeling it came from Leicester market. It is incredibly similar to the ponte that I used to make one of my recent Chestnut sweaters. As before, I wanted to make the dress version (there is a top also). I traced out the pattern (as I needed a smaller size than what I made before), and was pleased to remember that there are only 3 pattern pieces for this dress. How simple! If you were to choose the funnel neck, cuffs or pockets then of course there would be more. For me though I wanted to keep it super simple. To give my stripes the best possible chance of matching up I cut the dress pieces out on a single layer of fabric rather than on the fold. This way I have total control over my pattern placement. I always do this with stripes. As most of you will know, Tilly and the Buttons pattern instructions are superb. Colour photographs and great written instructions guide you through the whole process, this would be a great beginners project. It takes next to no time to sew. For best results I used ball point pins and machine needles, ( I used a ball point twin needle to finish off the neckline, hem and cuffs). 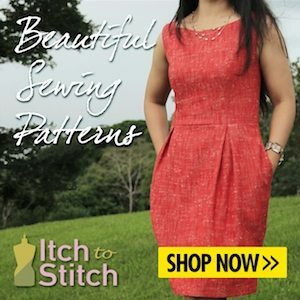 I used both the regular sewing machine and the overlocker for this project. The sleeve width feels a little wide. If I were a little more clever I would have looked back at my last review before I made this one and taken note that I mentioned that the sleeves needed narrowing down next time I were to make it. Lesson learned. It’s not a problem. I can always alter them if I really wanted to. The length is just right for me. I needed to make no alterations on it at all. I am so pleased with how it has turned out. I have my eye on this gorgeous red and white striped fabric on the Tilly website and think that this would make a beautiful version for the Spring. All in all it’s a super little dress which is so comfy and easy to throw on. I am going to love wearing this one.